On September 21, 2005, Hurricane Rita slammed into Johnson’s Bayou, Louisiana as a Category 3 hurricane. An estimated 3 million people evacuated the Texas coastline just as a severe heat wave settled in on the coast. Roads were clogged; most gas stations were out of gas. Franklyn Rae, his wife Rossana, and her brother were living in Pasadena, Texas at the time. Even though Rita was bearing down on the coast, Franklyn and Rossana didn’t want to leave. They were running low on money and didn’t want to spend what little they had in an escape effort. As a result, the Rae’s were slow to make the necessary preparations to leave town. They finally decided to head north even though they had to borrow the money. Franklyn was a carpenter at the time, so they loaded his pick-up truck with his most valuable tools. Then they loaded their dog and headed north to Dallas to stay with family until the storm blew over. But the roads were chaos. Traffic jams, cars out of gas, people with medical issues, and tempers running just as hot as the temperature outside. I-45 heading north had become a parking lot. Franklyn had settled into the far left lane hoping it would be the fast lane. And while it might have been creeping along a little faster, it meant he was blocked in. He was also cut off from the occasional exit ramps. Traffic was slow, then it crept, then it was at a stand-still. It took them 14 arduous hours to reach Huntsville, normally an hour and a half drive. They were still in the left lane when Franklyn felt he had a word from the Lord. God seemed to be telling him, “I can’t work with you in this place. You need to get off the Interstate.” Franklyn looked to his right at the upcoming exit but it was going to take an act of God to clear away all the traffic between him and the ramp. Cars ahead began to inch forward. Then an amazing thing happened. As the cars ahead moved forward, the cars to Franklyn’s right didn’t move at all. The drivers of both cars appeared to be asleep at the wheel which caused a miraculous gap to appear in the traffic. Franklyn was able to slip over across two lanes of traffic and take the exit off the highway. He quickly made a new plan: head east to look for another route that might take them north to Dallas. They had driven a few miles when they decided to stop at a gas station for fuel. The station was closed, so Franklyn chose to sit in the traffic and wait for the station to open. While waiting for gas, several people slipped into a gap in front of Franklyn’s car. Franklyn was furious! Once the station opened, it was going to be tough to get gas and now all these extra cars had butted in line in front of him. His temper was rising as he got out of the car. Franklyn was hot and tired and at the end of his rope. As he walked to the car in front of him, the words came up into his head and he let the driver of the car have it, holding nothing back. Ultimately the situation blew over but Franklyn knew that he’d lost his temper. He was ashamed, knowing that he’d said and done things he wished he could take back. Intent on keeping short accounts with God, Franklyn quickly prayed that God would forgive him for allowing his flesh to react angrily. He immediately felt the peace that comes with God’s grace. His slate was now clean. The Raes ended up seeing quite a few “lost temper” moments on those roads north of Houston that week. As morning broke they were finally able to get some gas and they proceeded to make their way north. They pulled off at a remote spot to have some lunch and stretch their legs. While they were parked on the side of the road, a little green Toyota came up the road in their direction seemingly from nowhere as there was nothing for miles around. A young girl was driving the car. She stopped and asked if there was anything she could do to help. They told her about the plan to head north and hopefully make it all the way to Dallas. She warned them that the road they were on wouldn’t take them where they wanted to go. The girl wasn’t sure about the best route but she said that her mother could give them better directions. She called her mom on her cell phone, then let Franklyn talk to her. She was able to give him the needed directions. They packed up their stuff and were ready to take off when they noticed the girl pulling out in her little green Toyota. She headed back in the direction she’d come from. The Raes looked at each other thinking it odd since it seemed they were in the middle of nowhere. It felt at the time like it must have been a divine appointment. Many times since that road trip, the Raes have wondered if the girl was their “little angel” on a heavenly assignment. The Raes finally made their way north toward Grapeland. They stopped at one point to help some others with gas and they happened upon a Baptist church offering free sandwiches to evacuees. In a conversation with the pastor and his wife, they learned about a camp up the road where they could get a shower, a hot meal, and maybe even a place to spend the night. And that’s how the Raes made their way to Frontier Camp. Franklyn and Rossana had an instant connection with Matt Raines and his team at Frontier who were already in the process of providing food and shelter to over 180 hurricane evacuees. (To be exact…during the hurricane, Frontier hosted 182 people, 27 dogs, 5 cats, 4 horses and a parrot!) The Raes, as did other evacuees, volunteered by doing some cleaning, washing dishes and helping out in the kitchen during their stay at camp. Franklyn even helped the camp maintenance crew board up windows in the dining hall. Matt offered a spot for Franklyn’s equipment so they unloaded the truck into a dry place while the storm passed over. After some long conversations and a tug from the Holy Spirit, Matt asked Franklyn if he’d like to share with the other evacuees on that Sunday morning. Franklyn told Matt that he would love to talk to the group. Immediately he remembered his heated incident on the highway just the day before. He decided to share the lesson he learned from that incident. It is important to stand strong when our flesh tends to assert itself over our better nature. The Raes weren’t at Frontier very long. Soon they were able to assume their trip north to Dallas while they waited to hear about any damage to their place in Pasadena. In the end, the storm passed. Frontier lost power and lost some trees but we were thanking the Lord that we’d been able to escape the worst of it. 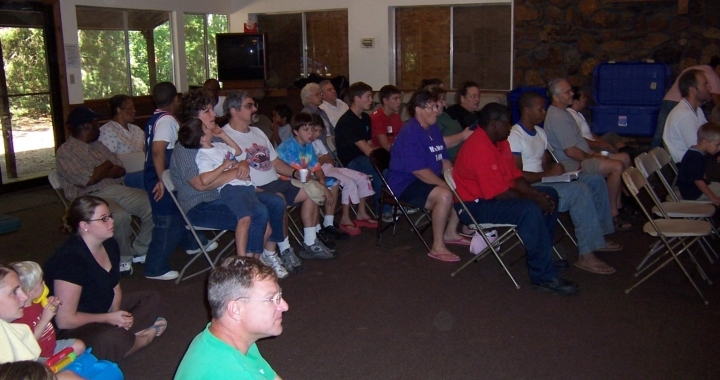 It’s one thing to graciously serve groups and campers we’re prepared to receive. But during those days, we were able to be a “port in the storm,” for so many, blessed to show the love of God to people we hadn’t plan to serve…people who had never planned to end up at Frontier. It has been said that “entertaining” is serving people you’ve planned to serve while “hospitality” is serving those folks you were not prepared for.